Good for the price. The sheets are not very soft, but the quilt look very nice in our guest room. Offer a sophisticated and artful touch to your bedroom with this stylish comforter set. The soft microfiber is highlighted with a bold yet gentle leaf design and serene, sunny colors perfect for any sanctuary. This is perfect, soft and just like the website describes. Perfect for my guest room everyone compliments the comforter. I already washed it 2x and its completely holds up like new. This bed set is so cute, but unfortunately in person it looks and feels cheap. The sheets are so thin they are able to be seen through and the king bed spread could probably fit in my regular size washer no problem if that tells you how thin it was. 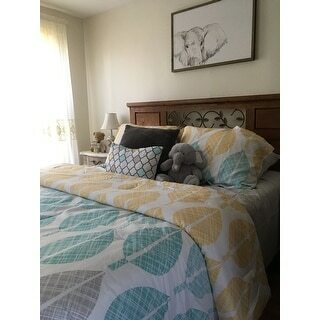 I love this set, the colors matched my room perfectly and the comforter is soft and fluffy. I’ve had it for a few months now and the sheets still look/feel about like they did when I got them. Durable materials. And the bedskirt is actually long enough to cover my box spring and more. I needed a new look for a guest room. This set is fine for that as it will not get a lot of use. The colors are more vibrant than they appear on my screen. The bed skirt, comforter reverse and sham backing are all gray. On the front of the shams the fabric pattern doesn't match up. But, as I said, it's for a guest room and will serve that purpose well. The Hyde Park sheets in the teal/turquoise color match to jazz it up a bit, too. This comforter is soft and easy to wash. We love the colors which brighten the Room. 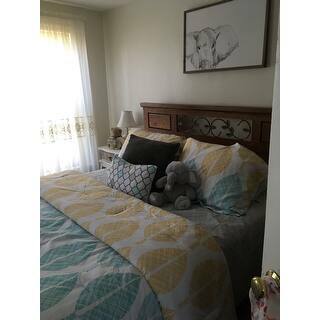 The sheets and comforter are appropriately sized for king size bed and the accompanying pillow and sham is lovely. Beautiful comforter set--such a great deal! Beautiful colors, very soft, and thick but not heavy. Extremely pleased with the quality for the price. I live in the Midwest and the comforter is the perfect weight for the 3 cooler seasons. The comforter, pillow shams, toss pillow and dust ruffle are very nice! Love the colors in the comforter. I didn't realize it came with a set of sheets! It will look great in my RV. The comforter set is beautiful and the material is soft. The cotton sheets were way to rough for our standards, we ended up buying another sheet set with a higher thread count. The 2 comforter sets I ordered are very nice. Colors are exactly as pictured and quality is very good. My only complaint was that it took so long to be delivered. Beautiful set with rich colors, exactly like in the photo. Love that this come with sheets, a bed skirt, pillow cases, shams, a comforter, and a throw pillow. So cute and high quality! And so cheap! The comforter is pretty and has a good amount of fluff. The sheets are thin and rough, not real high quality on the sheets, but otherwise, it’s great. It looked just like the picture and the quality of the fabric was quite good. It brightened up my bedroom with the color combination Very pleased. This bed set was extremely disappointing. The quilt feels very cheap and the sheets are totally scratchy. After 1 wash, there are threads everywhere. I will most likely not keep this. Great looking comforter set! Not soft and cozy, but great for warm climate or spring/summer. "Hi, what size is a Cal King? I'm after a super King (Australian size)." I chose this product because my mother wanted to brighten up her room and she loves yellow/ gray combo. It also has a little splash of aqua whats makes it pop more . Over all the set looks soft , peaceful and relaxing. The color scheme goes well with the paint in my room and bathroom. I also liked the design. Saw it a while ago at Kolhs and really liked it but it was really expensive. I change out my bedrooms often so I don't like to spend a lot of money.